The prime example of a teleological approach to economics can be found in the first part of Aristotle’s Politics. He defines economics as the art of creating the material and social conditions for the survival of the oikos or household. 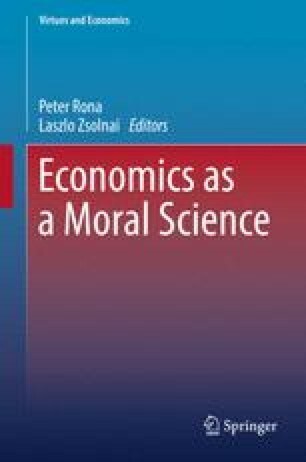 Simultaneously, he integrates economics in a social matrix that subordinates economics to politics and ethics. Modern philosophy and economics is anti-Aristotelian and anti-teleological. Modern economic actors are supposed to be driven by autonomous preferences and free choices. The market functions as a causal equilibrium mechanism that promote welfare for everyone as an unintended byproduct. Although Adam Smith interpreted this unintended teleological effect as an ‘invisible hand’, he was one of the first moral philosophers to underpin this order with a non-teleological substratum. After him, the deconstruction of teleology pursued its logic giving way to the idea of economics as a process of ‘creative destruction’ (Schumpeter). The paper explores how thinking economics as a relational dynamic opens a space for human creativity without losing the embeddedness in an ecological system of meaning and purpose.